Nur is a common name, but it is just as likely that it is not his real name; he has been living for some time on the coast of Kenya near Lamu, one of the last standing examples of Islamic architecture, not far from the Somali border. He is a little over forty years old, he speaks broken English and is constantly chewing on “khat,” leaves from a plant that grows in some areas of Kenya and Ethiopia which cause a mild state of euphoria and are commonly used in Somalia. Although he was initially diffident and almost scared of my questions, he overcame his hesitation in front of a few banknotes and accepted my invitation to tell his story and his experience as a pirate. He was born and grew up in a little fishing village on the coast of Somalia, not far from Bosaso. He started going off to sea when he was 12 years old, just like his father and his brothers had done. “The sea was full of fish, we would get back to shore with the boat overflowing with tuna, sharks, lobsters and large prawns. Then came the foreign fishing boats; they would fish illegally and they didn’t hesitate to ram our ships if we got too close. We couldn’t fish anything anymore, so we organized ourselves to confront this threat since the government wasn’t doing anything to protect us. Now they call us pirates, but we were just protecting our sea.” It was 1998. Nur and his comrades had seized their first fishing boat. “It was easy and we made a lot of money. They paid a hefty ransom and we decided that it was an easy way to make money.” From fishing boats to cargo ships passing through the Gulf of Aden, “these were a more lucrative prey because the ship owners are more willing to pay to get their ships and cargo back without too much discussion.” But this profitable activity soon caught the eye of big criminal organizations: the “warlords” intervened as leaders of the most important local clans of rebels with small private armies at their disposal. They enlisted the fishermen through persuasion and intimidation. “You either work for them or they kill you,” says Nur, “but I refused to because I didn’t like the idea of risking my life for so little money while working for an organization that’s getting richer and richer. My friends and I tried continue on our own anyway but it was dangerous. Not at sea, where we are the masters, but when we were on dry land we constantly ran the risk of being killed: they burnt our houses down, they threatened us and I realized that my life was at stake, so I ran away.” He doesn’t seem to want to stop talking now. As he chews fervently on “khat,” drinks Coca Cola and smokes cigarettes, he tells us all about his deeds, about seizing ships. He excitedly flaunts his courage but his stories now seem invented rather than actual events. I had visited that region back in 1995: the seashore north of Mogadishu was full of beached cisterns, rusting and leaking a foul-smelling viscous liquid; the local residents talked about dead animals and sick people, about ships dumping barrels into the sea, like the ones that come aground along the shore. The fishermen would often have to cut their nets because they would get tangled in the barrels lying on the bottom of the sea. The United Nations Environmental Programme (UNEP) has often denounced this trafficking in hazardous waste coming from Europe, warning about the impending ecological disaster. This is a shady business; it is a story involving foreign multinational corporations, mafias, corrupt politicians, secret service. In 1994 the journalist Ilaria Alpi, who was conducting an investigation for the Italian news programme TG3, was killed along with her cameraman Miran Hrovatin in Mogadishu because she might have discovered something highly compromising. I arrived in Eyl after a long and rather dangerous trip, constantly running the risk of being attacked by groups of armed gangs who control the territory and are always fighting among each other. Eyl used to be one of the many little fishing seaports, with mud huts, dirt roads and just a few hundred inhabitants. The fishermen tried to survive as best as they could. To make ends meet they would sell their fish in the local market; women coming from the hinterland would come once a week to buy fish. The earnings were impossibly low because most of fish would go bad after a few days since there were no refrigerated storage spaces. Moreover, the largest market, the one in Mogadishu, is 600 kilometres away, there were no ice trucks to transport the fish and nobody wanted to embark on such a hopeless journey. The streets are “unsafe“ because morian” (bandits) run amok in their off-road vehicles with machine guns and grenade launchers mounted on the back, blocking every vehicle on their turf. Now there are more than two thousand people in Eyl. Sumptuous mansions have been built for the traffickers; there are fuel deposits for the pirates’ motorboats; there are inns and restaurants where the hostages who are kidnapped during the assaults are fed and given hospitality (at their own expense), while the seized boats are moored in the harbour or in other coves along the coastline. 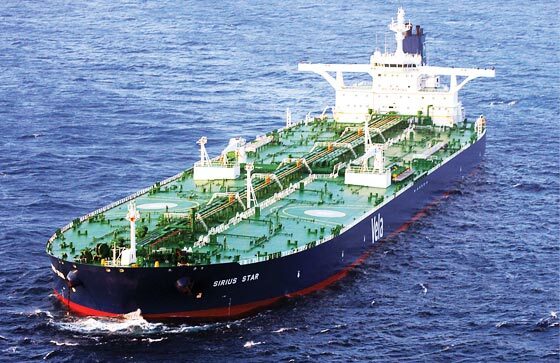 The Sirius Star is a large Saudi oil tanker that was anchored 450 miles off the coast of Eyl. It was transporting 2 million barrels of crude oil when it was seized on November 15th; it was the biggest exploit in Somali piracy after the highjacking of the Ukrainian ship Faina carrying 33 tanks and other equipment used in warfare. This cargo was originally destined for the Kenyan army, although the government of Nairobi has firmly denied it; other sources report it was meant for Sudan. This ship, along with its dangerous cargo, is anchored in the Harardheere harbour, and it would be a real tragedy if it ended up in the hands of the Islamic insurgents. 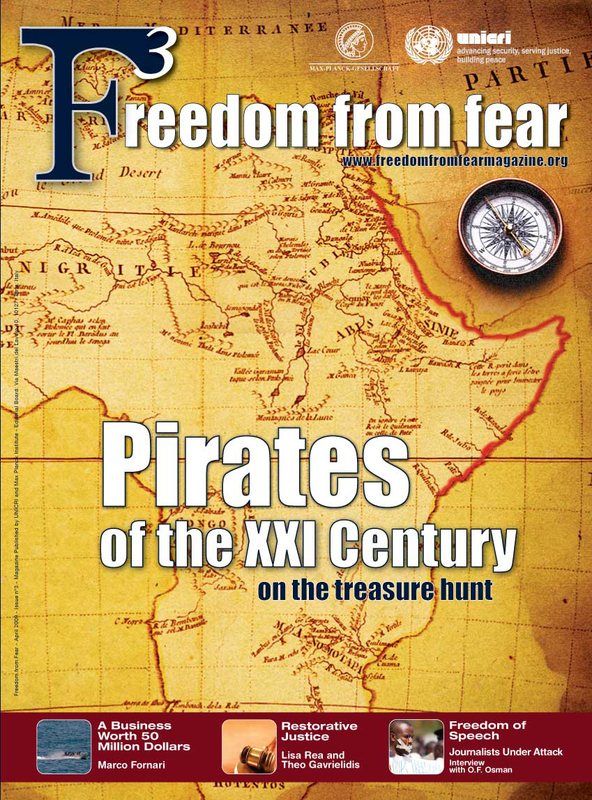 It seems as though there were some differences of opinion among the pirates who highjacked the ship: some of them wanted to unload the weapons and the tanks in order to sell them to the highest bidder (it was said that the Eritrean government had expressed interest in the purchase), while others just wanted the ransom money. According to sailors onboard an American battleship stationed near Faina, there was a gunfight between rival groups in which three pirates died, and unconfirmed sources report that another crew member succumbed to illness. Eighty ships have been seized by Somali pirates since the beginning of the year. According to more conservative estimates, the turnover amounts to 50 million dollars but this figure is destined to increase if, as speculated, a 25 million dollar ransom was demanded for the Sirius Star alone (other sources report that the ransom request decreased to 10 million dollars). The negotiations took place in Eyl, the pirates’ headquarters, a modern-day Tortuga, the historical Haitian base of the Welsh pirate Henry Morgan who terrorized the waters off the Antilles by attacking dozens and dozens of Spanish and Portuguese ships between 1660 and 1670. From the princely mansions that are highly protected by armed militiamen, orders are sent out to the mother ships lying off the coast with their flotillas of speedboats, which quickly carry these modern-day buccaneers to their targets. With a few rounds of machinegun fire or a few grenades they force the crew to stop their ship. The pirates swiftly board the ship with grappling hooks and rope ladders and force the captain to set sail toward their ports. The pirates communicate the successful boarding by radio and the organization immediately contacts the shipping company, which has usually already been contacted by radio by the captain of the ship under attack. A few hours later, in the dusty streets of Eyl, modern off-road vehicles arrive carrying mediators and negotiators. Most of the time the negotiations are quick and the ransom is paid in cash. At first it seemed as though the system of choice was the “hawala”, an informal money transfer network popular among migrants. But now the pirates want hard cash to be delivered at the moment of the handover. After the attack on the super oil tanker, it was thought that the pirates were making use of infiltrators who were informing them about the departure of ships with important cargos and the course they were following. In order to avoid the Gulf of Aden, the Sirius Star had chosen to navigate the Cape of Good Hope, even though circumnavigating Africa (following the course discovered in 1498 by Vasco de Gama) would extend the journey by two to three weeks, with an increase in cost of roughly 500 thousand dollars. Nevertheless, the pirates were waiting for them, far from their usual course. Thus, someone must have informed the pirates of the last-minute decision taken by the ship owner. There are over fifteen gangs operating in these waters; all of them are equipped with very fast speedboats, machineguns, grenade launchers and sophisticated radar and GPS technology. The most bloodthirsty of them are based in Eyl, like the Somali Youth Coastguard and the Somali Marines. Facilitated by the ineffectiveness of the Mogadishu government, these groups, which were originally mobilized to counter illegal fishing in national waters by large Asian fishing boats, attacked ships that were dumping toxic waste into the ocean. Their goal was not to prevent the hazardous waste from being thrown overboard and polluting the ecosystem, but to demand a kickback. This earned them much money and, thus, the local “rais” took over: they hired the fishermen in order to exploit their skill and knowledge of the sea, they put their armed militia onboard and they became true pirates attacking ships in transit. Today, the waters off the coast of Somalia are the most dangerous in the world. Following a request by the UN, there are now roughly thirty warships belonging to various nations – including Italy, which has been given command of the operation – cruising the area; their presence has foiled a considerable number of attacks, but over the past nine months the International Maritime Bureau’s Piracy Reporting Centre has registered 107 attacks, 27 of which failed. Pirates can do whatever they want, partly because rules of engagement limit the actions of warships patrolling the Gulf of Aden and they can only intervene if there is an act of piracy underway. Italian ships succeeded only once, in April, when the destroyer Etna responded to an alarm launched by a cargo ship under attack nearby and foiled the boarding attempt by deploying a helicopter which forced the pirates to desist. Roughly a month ago, there was a gunfight involving the Indian frigate Tabar, which sank one of the pirate mother ships because the crew refused to let their ship be inspected. According to the captain of the Tabar, the assailants had missiles and grenade launchers in place and were preparing to attack the Indian frigate, which responded. In Somalia and in the Horn of Africa, piracy is a means of survival. It is born of necessity; these modern pirates were formerly fishermen but in 1991, when the civil war that is still ravaging Somalia broke out, they could no longer do their job; this was because of the illegal competition of Chinese and Japanese fishing fleets which, undisputed and unpunished, are depleting the fish population of Africa. Satellite pictures show approximately 700 foreign boats fishing illegally. As mentioned above, the first attacks were carried out by Somali fishermen against this competition. When they found they could act undisturbed, they began targeting ships transiting through the Gulf of Aden and have now extended their range of action to hundreds of miles off the coast of Somalia. There are huge profits and virtually no risks involved because the crews of the cargo ships put up no resistance; they try to avoid being captured but it is difficult for these huge container ships and oil tankers to outrun speedboats. Sensing a good deal, the warlords have intervened; traffickers living in Dubai or Yemen and fishermen are hired by gangs of pirates and the number of attacks has increased. Foreign warships patrolling the area are creating some difficulties but the business is too lucrative and the traffickers stop in front of nothing. From their mansions, they monitor the operations, they locate the most interesting targets, they conduct ransom negotiations, pocketing millions of dollars, and they do not risk a thing. The ones paying the consequences are the pirates themselves, as they skim over the water with their speedboats, risking their lives for a few thousand dollars: a real fortune in a country as poor as Somalia. It is a dramatic choice for them: either dying from deprivation on dry land, risking their lives on the stormy seas or being killed by the cannonballs of warships. Francesco Fornari is a freelance journalist, and he has been reporting extensively from Africa for 34 years.